Want Subaru Liberty information and resources? You are at the right place! The Subaru Liberty started life in Australia in late 1989 when Subaru Australia started importing them. A hotter model of the Subaru Liberty arrived in the form of the RS in late 1991, featuring a 2 litre turbocharged engine, the Liberty was a solid performance machine for its time. The have been five generations of the Liberty with the fifth generation model was released in 2009. 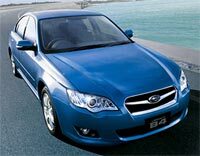 The Subaru Liberty has been a very successful model for Subaru and each new model has a lot of expectation riding on it. Based on the latest depreciation data, the Liberty is one of the best cars for value retention. When buying a Subaru Liberty you should check to see what kind of life it has lived. Many of the performance models may have led a hard life and been driven quite hard. Check the condition of the clutch as this is the weakest part of the drive train. The Liberty RS now getting on in the years will see most example having quite a number of K's on them. They also may getting to a point where major work will have to be undertaken. A professional inspection by a mechanic who is familiar with Subarus would be a wise investment. Visit the Used Subaru Liberty tips section for more details on things to watch out for in a used Liberty. Subaru Liberty Wagon models are also available. Older Subaru Liberty - You can visit our older model section of the website for some info on an older model Liberty you might be looking at purchasing. The 2007 Subaru Liberty has helped Subaru dealers to achieve great sales for January, sales in Tasmania increased 150% on last year, while in New South Wales sales were up 56.9%, in South Australia sales were up 36.4%, in Queensland sales were up 10.2% and in Western Australia they rose 45.2%. Sales figures for July have also been very impressive with the Subaru Liberty selling 12.4 percent more cars than in July 2006. The Subaru Impreza also received record sales for July with 23.1 percent more sold versus the same month last year. Have a question? Leave a message here.